Can you lose weight on your own after having done the hCG Diet? Can you maintain weight lost from hCG long term? This may not be true for everyone, because many women were completely unable to lose weight on their own prior to hCG and this may not change. But for others who found hCG to be simply a jumpstart to changing a bad eating lifestyle, it can lead to being able to continue the process of weight loss on your own. Elke lost about 70lbs with hCG, and has since gone on to lose another 13 lbs or so on her own, with her own version of clean eating, watching the amounts of food she eats, and exercise. All these stats of weight loss below include loading weights. She started each round by weighing herself after her load. Weight Lost: 20.8 lbs on a short 3 week round (she says she most likely gained more weight loading on this round which accounts for a higher average of weight loss). Weight Lost: 29.8 lbs lost on an EXTENDED round of 60 vlcd’s on the diet. She’s been maintaining her weight loss (and actually losing further) since May of 2013 which is now almost an entire year later. She is currently 145 lbs, a full 13 additional pounds lost on her own. I actually like the term “found” because honestly, isn’t it true often, that we literally kind of aren’t really aware of what’s happening to our bodies until we are already 30-50 lbs overweight, and we wake up one day and go WOA what happened to me? For her it was the classic head to college story. Top ramen, eating out with friends too often, super burritos at 4 in the morning. Yep it all makes sense. She says she “ate until it hurt.” I think a lot of us are familiar with this. Even though she would feel full, she’d keep eating. A combination of emotional eating, and not paying attention – eating because the rest of the super burrito is still there, so you might as well eat it type of thing. She decided to stick to loading pretty clean, which means staying away from sugars and starches and really focusing on fats. She tried something a little different, which you could technically call “off protocol” and it seems to have worked well for her – she used the Jay Robb protein shakes for 1 of her meals while on P2. For one P2 meal she would blender up the jay rob shake, some lettuce or spinach, and one of her fruits and she did that pretty much daily while on the diet for all three of her rounds. She chose to avoid apples much of the time because she had read of some people stalling on apples. This may be because the apples are a higher sugar/carb content than the other fruits, so I think, especially since she was blending up the fruit, it was a wise choice on her part to stick to the other fruits for her shakes. She has used all their flavors on hCG, but she liked chocolate the best so usually stuck with that. Outside of this, she pretty much stuck to what worked and didn’t experiment with a bunch of other things. Her goal was to lose the weight and move on. People usually either love or hate P3 and Elke loved it. I want to preface what she did and what worked for her by saying that what you can eat without gaining on P3 is HIGHLY individual. Elke was able to introduce dairy, nuts, AND fruit right away without consequence- pretty amazing – for many these are all foods that need to be tried and introduced later in P3. But it goes to show that you need to find what works for your own personal body. Her first P3 meal was egg whites, swiss cheese and spinach with hot sauce and some strawberries on the side. Almonds for a morning snack. Chicken salad for lunch. Afternoon snack 1/2 grapefruit. Dinner some protein and a veggie. This was her first time ever eating multiple meals throughout the day – previously she had never been a breakfast eater, but really has taken a liking to eating smaller meals throughout the whole day. I’m a major carnivore and my body just seems to love meat, so I loved hearing Elke’s story because she has found that her body really loves the fruits/veggies/dairy/nuts type foods and not so much on the meat side. She says she was definitely an emotional eater prior to hCG. She was a long way from home when she went off to college and as an only child who was very close to her parents, she turned to food when she was alone in her new location. In a nutshell, she started researching and reading whatever she could find. Articles discussing aspartame, GMO corn, and just how processed foods affect our bodies. Elke had an interesting story related to this. Some of her family is from Jamaica and she said while they have plenty of “take-out” style places to eat in Jamaica she said the majority there don’t get overweight, but when her aunt from Jamaica, who is a tiny petite person came to the states to visit for a couple months, she gained 15-20lbs during her stay. Her aunt was a little dumbfounded as to why that was happening. Upon her return, the weight disappeared. Makes you wonder what’s going on with American food. Elke herself said she didn’t have trouble with her weight when she was growing up eating the home cooked food of her parents- it was that transition to college when she suddenly started eating a lot of processed food that her weight got out of control. It seems that it’s not all just about the calories – what those calories are made up of play appears to play a big role as well. Along with this, I have discovered there is some debate about Quest bars being as healthy as some think – apparently it raises many people’s blood sugar in an alarming way and/or causes bad carb cravings, despite on the packaging appearing to be pretty healthy. She planned her rounds by carefully scrutinizing her calendar. After September she saw that there’s basically holiday after holiday and she foresaw a lot of problems with dieting around that time, so she chose to do the protocol and be completely done, even with P3, before this time period. Then she could go home to visit her parents with festivities going on in Phase 4. When she came home after a month away she says she actually had lost a few lbs while there by really watching her portion sizes and making sure she was already stabilized and done with Phase 3 when she was there. She knew it would really be too hard to be in that phase while with family and food all around her. Phase 4 and portion control made for a successful month back home with her family. She wanted to be able to do phase 2 and phase 3 in the controlled way that it kind of needs to be done, so she made sure to time it in this fashion. She eats a lot of quinoa, brown rice, veggie burgers, nuts, avocados, coconut, lots of fruit. Elke discovered pasta and white rice really mess up her digestion and make her really bloated. She is able to eat bread however without those symptoms. Go figure. She said she couldn’t have known that her body would do so well eating less meat. Again, since my body does so well with meat, I just find it so fascinating how your really sometimes have to experiment and if something isn’t working well for weight maintenance for you personally, there just may be an entirely different way of eating that would suit your body much better and you won’t know until you try things. This is something that often gets skipped over in discussion but is a very real challenge many of us have faced when going through the weight loss process. Elke mentioned to me that she introduced exercise after finishing hCG, but she had a struggle- something that was a bit of a barrier to her getting started with this. She was now 158lbs but her mind was still at 227 lbs. 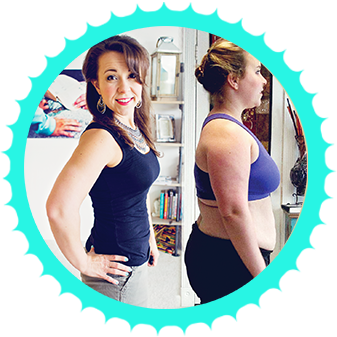 She wanted to try out this pilates place but she was worried about being judged – that people would look at her and go “what’s SHE doing here?” She was still seeing herself as being really overweight, where she had started. She says she still has to remind herself where she is actually at now. She finally managed to get there with the little push of a friend and she realized all her fears weren’t really real. No one was looking at her when she went. She realized that everyone is worried about their own thighs. When clothes shopping too – even though she was now a small, she would continue to automatically go to the larges on the rack. Then in the fitting room they’d be all falling off and she’d have to keep asking for smaller sizes. Her family was supportive after learning about the details, but she said she ran into trouble with some of her friends who really weren’t supportive of her decision to do this protocol. Trying to convince her to eat and drink with them when she specifically told them what she was doing, telling her she would just gain the weight back, etc. She took this and used it to work harder and stick it out and in the end she felt she needed to withdraw from some of those unsupportive friends. During P2 and P3, she created menus for herself of recipes she could cook. She acknowledged to herself that she was going to have to start cooking a lot more for herself. She realized that she wouldn’t be able to go back to eating take out after hCG was over. Which she says is difficult when you live alone- it’s challenging to feel motivated to cook homemade food when it’s just for one person. One thing that helped her was finding great recipes and alternatives to traditional ingredients on pinterest. It’s obvious in talking with Elke how confident she is that there’s no concern over regaining her weight loss. She has her healthy routines and sticks to them and it’s really working for her. Well that’s a wrap! There’s actually (amazingly) a lot more in the actual interview, so listen to hear the whole story. Hi. Do you have name on Pinterest site? I tried clicking on link above and just get the turning wheel. Sorry, no, hCGChica is not on Pinterest. Pinterest closed hCGChica’s account because it has to do with hCG. A lot of online website do not allow hCG to be discussed unfortunately so I guess that’s what they’ve decided and they just totally closed the whole hCGChica account and all her boards. See I don’t understand that when people say they still feel fat after losing so much weight. Shoot I was on top of cloud 9 when I lost 40lbs in 2011. I felt different I felt amazing!! Soon I will be back to that and lower. Praying to god I can see 170lbs someday even 145!! I have NEVER been smaller than 170. I see why I haven’t been seeing your interviews on youtube! They are all on your site now!! Love this one!!! This story is so me!!! and she has natural hair!!! LOVEEEEE! What do you think of 200-250 iu injections?